Senator Smith was born on December 14, 1897, in Skowhegan, Maine to working class parents, George Emery and Carrie Matilda Chase. Margaret attended public school, played on the basketball team,and graduated in 1916. Over the next decade, Margaret held several jobs including schoolteacher, business officer and treasurer. In 1922, she helped found the local chapter of the Business and Professional Women’s Club in Skowhegan and by 1926, she was president of the statewide group. After she married Clyde Smith, a local politician, in 1930, Margaret developed political ambitions, and shortly thereafter, she was elected to the Maine Republican State Committee. In 1937, Clyde Smith was elected to represent Maine’s second congressional district in the U.S. House of Representatives, and Margaret went with him to Washington, D.C., where she worked as his secretary, office manager and speechwriter. Clyde suffered a fatal heart attack in the spring of 1940, but before he died, he encouraged Margaret to run for his seat in the next election. She won the special election unopposed, and shortly thereafter, the general election by a large margin. Representative Chase Smith was reelected to the House in 1942, 1944 and 1946. During her tenure, as a member of the Naval Affairs Committee, she toured the South Pacific during World War II and was a strong supporter of women in the military. She also served as the chair of the Subcommittee on Hospitalization and Medicine and used that clout to pass the Women’s Armed Services Integration Act in 1948. An independent thinker, Representative Chase Smith supported several Democratic policies and legislation, including the Selective Service Act, some New Deal programs and President Truman’s foreign policy. 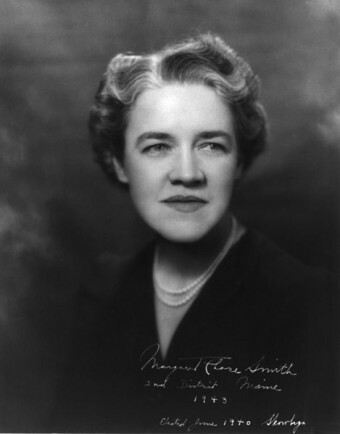 She also broke ranks with her Republican colleagues from time to time, and opposed the strike- and union- busting Smith-Connally Act in 1943. Unlike her position in the House, which she first obtained, at least in part, from her husband’s passing, Margaret’s ascension to the Senate was entirely her own doing. Margaret won that Republican primary and went on to defeat her Democratic opponent in the general election by a wide margin. By winning the Senate seat, she became the first woman to serve in both the House and the Senate. A national feeling of fear and frustration that could result in national suicide . . . . Freedom of speech is not what it used to be in America. It has been so abused by some that it is not exercised by others. The speech ended with a Declaration of Conscience that decried the “selfish political exploitation of fear, bigotry, ignorance, and intolerance,” being practiced by a few of her fellow Republicans (including McCarthy). Several other Republican senators joined her declaration, and later, Senator McCarthy would refer to them collectively as Snow White and the Six Dwarfs. Senator Chase Smith easily won reelection in 1954, 1960 and 1966. Notably, in the 1960 general election, the Senator defeated Lucia Cormier, making their 1960 run the first all-female campaign for a Senate seat in American history. In 1950, she was commissioned as a lieutenant colonel in the Air Force Reserve, a post she served through 1958. As a member of the Senate Armed Services Committee, Senator Chase Smith was a hawk, advocating for the use of nuclear weapons against the Soviet Union and supporting the Vietnam War. She was also a strong supporter of education, civil rights, Medicare and the space program, the latter of which, contrary to popular belief, was not supported by the majority of American citizens. In fact, according to Smithsonian space historian Roger Launius, during the early days of the Apollo missions, the U.S. space program was one of the top government programs Americans listed that they thought should be dropped, with a full 60% of Americans feeling that the U.S. was spending too much money on space flight. Despite her earlier popularity, Senator Chase Smith lost her 1972 re-election bid. After losing the 1972 Senate election, Margaret toured the country, lecturing at various colleges and universities for the Woodrow Wilson National Fellowship Foundation. She later returned to Skowhegan where she installed the Margaret Chase Smith Library Center. Senator Chase Smith received the Presidential Medal of Freedom from President George H.W. Bush in 1989, and she died on May 29, 1995.